Brent Jackson was elected to the North Carolina Senate in 2010 and is currently serving his fourth term representing Duplin, Johnston, and Sampson counties. He is the co-chairman of the Senate Appropriations/Base Budget Committee and serves on numerous other committees as well. Jackson and his wife Debbie are first generation farmers, starting Jackson Farming Company in Sampson County in 1981. They currently grow watermelons, cantaloupes, honeydews, strawberries, pumpkins, corn, wheat, soybeans, peanuts, flue-cured tobacco, occasionally cotton, and various other crops. Question #1: There are only five North Carolina legislators (about 2% of the General Assembly) who list farming as their occupation. As a farmer, what perspective do you bring to the General Assembly? Conversely, is there anything you’ve learned as a legislator that has given you new perspective on the farm? There are a wide variety of backgrounds amongst my fellow legislators, and I believe that everyone’s individual and unique experiences are a source of value. As a farmer, I have tried to ensure that my colleagues know where their food comes from and the work that goes into putting food on the shelves. I have also made it a point to stress the goodness of American agriculture and the wonderful and exciting career opportunities that exist, especially for young people. Question #2: In your opinion, what is the most significant state-level issue facing farmers in North Carolina? And what is one issue that may not be on the front-burner for farmers that you think they need to pay more attention to? Why? I think there are several main issues that we will have to continue to work on at the state level. The first is labor, although mainly a federal issue and President Trump and Congress are working on a solution. However, it is important that from a state level, we are careful not to pass laws making it more difficult for farmers to use a legal workforce. Without a reliable and legal workforce, crops cannot be harvested. We must also make sure that our regulatory framework is set up to foster growth in the industry and recognize that one-size-fits-all regulations rarely work in farming. Water rights will continue to be an issue that we must remain vigilant on. It will be important for farmers to make their voices heard as the EPA goes about reviewing and rewriting the Waters of the US (WOTUS) rule. Farming is a way of life in rural North Carolina, and we must do a good job working with our urban citizens to ensure that rural and urban North Carolina works in harmony. Another issue that we must tackle to ensure the future of farming is the average of the farmer, which in North Carolina is in the mid-50s. Too many of our children in rural communities are moving off the farm and to the cities. It is crucial that we make sure we inspire the next generation of farmers and expose our children to the career options that the ag industry offers. We must also make sure that we help first-generation farmers overcome the barriers to entry, especially given the price of equipment and land. Question #3: Obviously, you’re very involved in agriculture policy at the legislature. What is another policy area you spend a lot of time working on? When Mike Smith enters a livestock barn in North Carolina, whether a county fair or the NC State Fair, you would think he was a local celebrity. 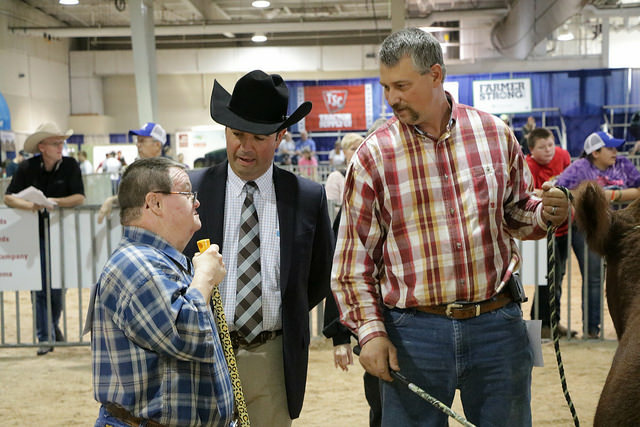 Truth be told, to many of those who participate in NC livestock events, Mike IS a local celebrity. There’s no shortage of families that offer seating, snacks, and most importantly, hugs to a kindhearted man that has become extended family to those in the barn. 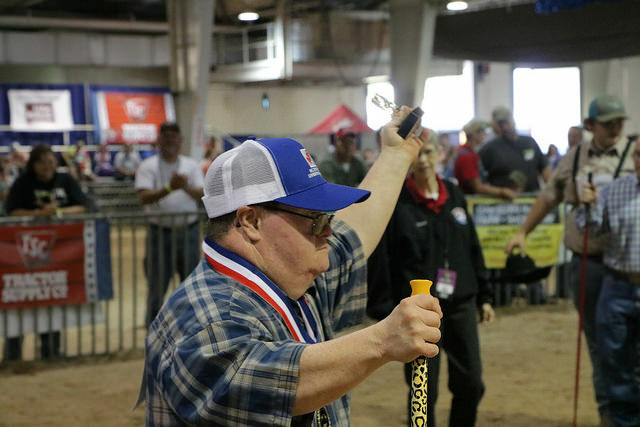 On Sunday, October 15, 2017, Mike’s celebrity status reached an all-time high, with his induction into the NC State Fair Livestock Hall of Fame. 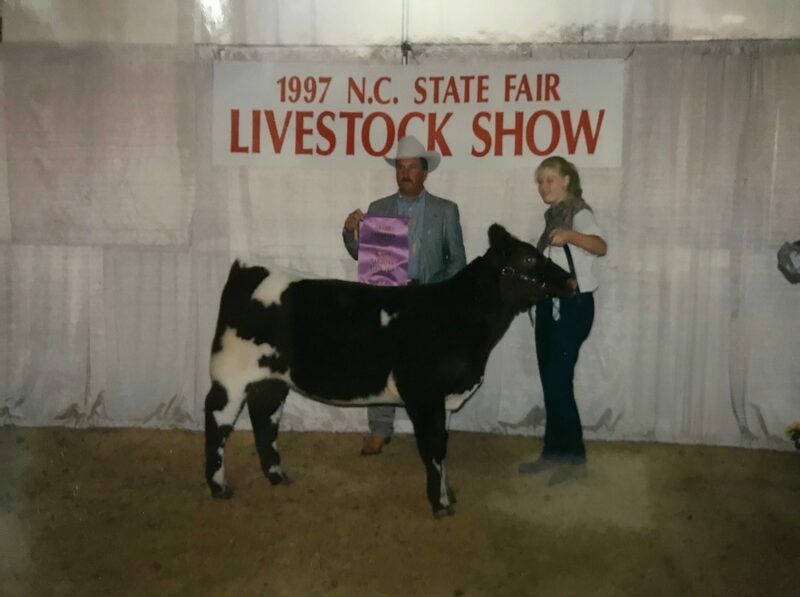 While most of the Hall of Fame inductees are lifetime breeders or financial sponsors, Mike, along with Mrs. Carol Turner, were selected for their roles in establishing a NC State Fair Competition that, for many years, was unique to our state – the NC State Fair Special Awards Livestock Show. In the late 1980s, Mike began traveling with his nieces as they competed in livestock events. While at those events, Mike’s job was to pick up manure from behind the cattle! When you heard Mike yell “PHONE CALL,” you knew it was code for ‘an animal left behind a pile of manure to be picked up.’ And you didn’t dare try to do it yourself – it was Mike’s job, and he was good at it! In the mid-90s, Mike began to ask why he wasn’t able to show when he traveled with, assisted, and watched his nieces enter the ring time after time. So, several county fairs would allow Mike to walk an animal through the ring before the shows started. But the NC State Fair was different – it was big, it was busy, and it didn’t have time to let one person walk through the ring. When someone asks, “if you could, would you go back to high school?”, most of the time my answer would be a resounding no. Personally, high school was an awkward time. I wanted to talk livestock, not watch the Friday night football game. I spent weekends at county, regional, and state fairs instead of at slumber parties. The ONLY reason I would consider going back would be because that is the age of eligibility for youth livestock programs. Not to mention, that age would mean participation at my favorite place on earth – the NC State Fair. The 2017 North Carolina State Fair kicks off tomorrow, and by the time it wraps up on October 22nd more than a million people will wander the fairgrounds playing games, riding rides, and eating all sorts of food. This year marks the 150th state fair, and it’s safe to say those first fairgoers back in 1853 might feel like they’re attending a completely different event. Like them, the State Fair I know isn’t filled with flashing lights, whirling rides, and a plethora of deep fried foods. The fair I know revolves around livestock – hogs, sheep, cattle, goats, poultry, OH MY! 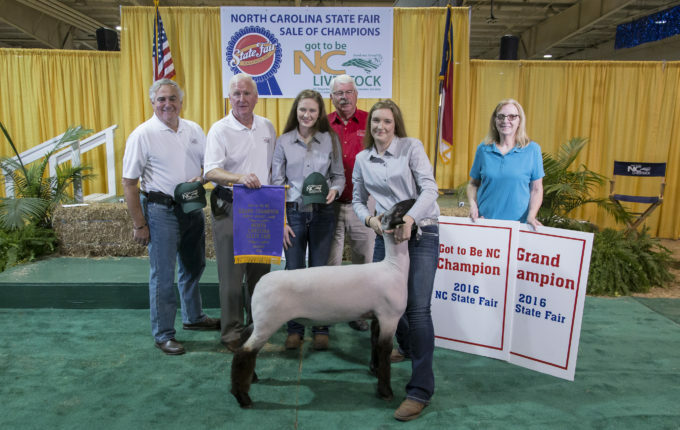 The first weekend of the State Fair focuses on youth market animals (meat breeds), exhibited by youth under 21. For the youth from across the state, the State Fair is the culmination of the year’s work. The county and regional fairs in the spring, summer, and fall are all leading up to the State Fair. It’s like training for a big marathon – there are smaller races throughout the year to build stamina, discipline, and muscle. The smaller race placings are icing on the cake, but the goal is the big one. And folks, the State Fair is the big one. Jimmy Dixon was elected to the North Carolina House of Representatives in 2010 and is currently serving his fourth term representing Duplin and Wayne counties. He chairs the House Agriculture Committee, is Vice-Chairman of Appropriations, and serves on numerous other committees as well. A few years after graduating from Wake Forest University in 1969, working for Procter & Gamble and teaching school, Rep. Dixon returned to his roots in 1973 and started a farming career raising poultry and vegetables for forty one years until his ‘semi-retirement’ in 2014. His poultry operation grew over the years to raising about 700,000 heavy tom turkeys each year. His main crop production was string beans, cucumbers, and peppers. He and his wife, Bobby Jean, have five children and six grandchildren. As a farmer in the General Assembly, I understand that there are many good reasons that we have remained a free nation for these many decades. However, all those reasons combined may not equal the fact that we have been able to feed ourselves and produce an extra amount of safe economical food and fiber to help feed a hungry world.We must never lose the ability to feed ourselves!I have learned as a legislator that the great challenges facing farmers are, in part, twofold. First, government can change the rules in the middle of the game and increase regulations that strangle efforts to be productive. Secondly, special interest groups have leveraged influence within Corporate Board Rooms across the nation that facilitate retail boycott to promote undue regulations and change practices harmful to many safe and well established farming production methods. Question #2: Has there been one agriculture-related policy provision that you have felt most passionate about, or that you feel would have the most positive impact on farmers? I think two of the most important legislative actions taken since I have been in the General Assembly are the passage of H405 Property Protection Act passed in 2015 and H467 Agriculture and Forestry Nuisance Remedies passed in 2017.I have probably been more passionate about these two bills than any other bills we have passed because of their far reaching positive effect on our ability to unshackle farmers from misguided special interest groups who rely on the sensational and abnormal portrayal of some of our farming practices. Question #3: What agriculture-related issues are you working on in preparation for the 2018 short session?